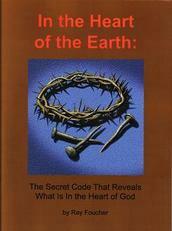 Jesus' resurrection is explained in the book In the Heart of the Earth: The Secret Code that Reveals What Is In the Heart of God" (pictured to the right) with some interesting new insights and significant scriptural discoveries. Here is a summary of the main points of the book. The book gives much more detail, the reasoning and scriptural support, and references from the writings of others. Topics on this site with new or additional material beyond what appears in the book are indicated (with links) in and following the summary below. This is an ongoing study and new material will be added from time to time. Chapter 1 introduces the topic of Jesus' resurrection by means of a story that gives the context. It also describes the method used - that of allowing the Bible to define its own terms by determining how it uses words. An example of this - the meaning of "heart" is given on this site's home page. Chapter 2 discusses how inclusive reckoning counts portions of time as a whole unit of time (day or year). But even using that you cannot get three days and three nights between a Friday afternoon crucifixion and a Sunday morning resurrection. Jesus compared His experience to that of Jonah yet Jonah was not dead. Jesus did not use the terms "grave" or "tomb" which He could have if that was what He meant. The time period was not referring to how long He would be buried. Word studies show that the Greek word "kardia" is never translated in the New Testament with the meaning of the middle or center of anything. The Greek word "ge" can mean the occupants of the earth. Jesus' use of these words in parables points to a different meaning for "in the heart of the earth." Being "in the heart of the earth" was a reference to being within the mind (will or control) of man. The three days and three nights started after Jesus' betrayal following the dinner at Simon's house on Tuesday evening. This would put the end of the time period on Friday afternoon. The exact time period is not the most important aspect of the sign. In fact, some gospel references to the sign of Jonah do not even mention the time. Chapter 3 demonstrates that the Greek word "sabbaton" means the seventh-day Sabbath. The phrase "mia ton sabbaton" means "one of the sabbaths" referring to the time interval between Passover and Pentecost. It has been mistranslated "first day of the week" in verses referring to Jesus' resurrection in support of the idea of Sunday sacredness. The original word "sabbaton" is in the plural form. It does not make sense to translate it into the singular word "week." Chapter 4 points out that Jesus said that what is commonly referred to as the last supper was a Passover observance and that there were sectarian differences in understanding of festal timing. References to a day of preparation prove that the crucifixion was on a Friday. The Wednesday crucifixion theory is briefly examined. Read 20 reasons why the crucifixion of Jesus Christ could not have been on a Wednesday. The procedures of harvesting grain for the Feast of First Fruits point to the initial harvest (resurrection) being just after sunset followed by a waving of the grain offering the next morning. A study of uses of the word "after" in key verses shows that this offering happened on the seventh-day Sabbath not on the first day of the week. Pentecost was and is always on a seventh-day Sabbath. The removal of Joseph's bones from his tomb in Egypt was parallel to Jesus' resurrection. Chapter 5 shows by carefully examining John's wording that the supper at Simon's house was on Tuesday evening. The women could have purchased the spices before the crucifixion. They did not come to embalm Jesus' body in the morning (that had already been done) but merely to anoint Him. The "next day" when the guard was posted started at sunset Friday evening. Chapter 6 reminds us of the many signs that Jesus was the Messiah proving that "there shall no sign be given to it but the sign of the prophet Jonas" must be referring to a sign of something else. See other evidence that He was the Messiah. A deeper look at the context of Matthew 12 shows that the significance of the sign Jesus offered was meant to reveal something in our hearts and in the heart of God. Chapter 7 gets to the heart of the matter, revealing the character of God in a better way than is usually understood. It identifies a principle showing that God does not use force and that it is Satan, the destroyer, who is behind the destruction and suffering that comes about when God, in honoring our free will, removes His presence and protection. The sign was all about God's character of love and His honoring of man's free will. He so highly values man's God-given right to exercise free will that for a period of time - "three days and three nights" - He allowed His Son to be "in the heart of the earth" (within the control of man) to do with Him as they pleased even to the point of crucifying Him. Remember, these are just a few highlights from each chapter. There are other important details in the text of the book. Since the book was published some additional items have been researched or expanded on. These are all listed and briefly explained at Jesus' Resurrection Addenda with links to each. View the book's Table of Contents. View a preview of the book. Please give me your understanding of what the sign of Jonah is a sign of. This is a survey question (please help me out) and an opportunity for you to get a free copy of this insightful book on the resurrection of Jesus Christ. If you have read this material about Jesus' Resurrection and would like to share something about it, please use the form below. Please don't just tell me what is presented is wrong without giving some Biblical evidence. I accept other points of view but unsupported submissions will probably not get posted. Submissions may be edited for clarity, grammar, spelling etc. The Resurrection on One of the Sabbaths?